Between 2010 and 2017 an average of 171 people moved to Portland each week. That’s over 62,000 new residents hitting the streets of what’s arguably the most bike-friendly big city in America. As such, it’s likely a good percentage are ready start biking more. And we want to make sure they all feel at home when they do. Are you new to town? 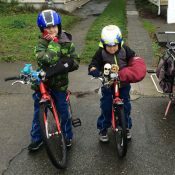 Do you know someone who just moved to here and wants to learn all the ins-and-outs of two-wheeled life in Portland? If so, hopefully Pedalpalooza and/or this amazing summer weather has piqued your interest in cycling. Now it’s time to cement that relationship by showing up for a new series of rides aimed at making you feel at home in the bike lanes. 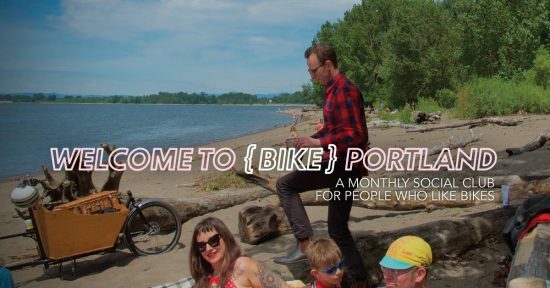 We’ve teamed up with Filmed by Bike and ORBike.com for Welcome to (Bike) Portland — a new social club for people who like cycling and want to take their local knowledge to the next level. We’ve got three rides planned for the next three months. The first one will this coming Saturday July 7th and it’s led by Filmed by Bike founder Ayleen Crotty. Ayleen is also behind cool local institutions like the Midnight Mystery Rides and Breakfast on the Bridges. She was also one of the pioneers of Pedalpalooza, Multnomah County Bike Fair and the KBOO Bike Show! Theme: Nature in the city. There are plenty of gorgeous escapes and swimming holes right here in the city. Get to know some of the best spots with a tour that ends with a picnic on the beach! Bring something to share (optional!). If it’s a hot day, you might want to bring a swim suit and towel. SWIM SUITS AND SNACKS ENCOURAGED! Distance: We will stop every 3 to 6 miles. Technically we will ride 24 very casual miles total but it won’t feel like that. Appropriate for: All adult riders (even if you have never before ridden 24 miles) with a functional bike. Youth riders who have ridden a good distance and are accompanied by an experienced adult rider. I’ll be leading a ride on August 4th where I’ll show you how to survive — and thrive — in Portland’s urban jungle. I’ll show you how I’ve learned to “read the street” and live in harmony with those big, four-wheeled, mechanized wild animals that rampage through our city. 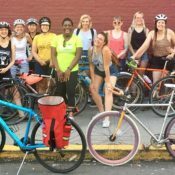 The September ride will be led by Meghan Sinnott, the bike-cultural powerhouse who organizes the World Naked Bike Ride, Pedalpalooza, the Tweed Ride, and more. Meghan’s will introduce you to Portland’s creative side — from murals to makers. 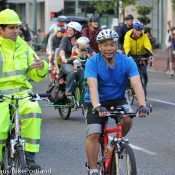 Make sure to stay in-the-loop and sign up for updates at the Welcome to (Bike) Portland website. And if you’re a biking veteran, please forward this along to friends and coworkers who are just starting out. Thanks! Very exciting — great ideas! Kudos to the organizers!! Anything Ayleen promotes will be absolutely fabulous! These are going to be top notch rides! YES! I’m so excited about this. Thanks for being on the team, Jonathan! We hope to see a lot of you out there this Saturday to kick off the social club! 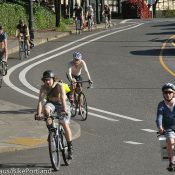 I wish I had known about rides like these, or this site, or Shift, when I started biking in Portland. We’ve heard that from so many people, which is why we developed this new social club!